The Kingdom of Commagene (Ancient Greek: Βασίλειον τῆς Kομμαγηνῆς; Classical Armenian: Կոմմագէնեայ թագաւորութիւն; transcription: kommagēneay t‘agaworowt‘iwn; Armenian pronunciation: [kommage:neˈa tʰagaworuˈtʰiwn]; Armenian: Կոմմագենեի թագավորություն; Armenian pronunciation: [kommagɛnɛˈi tʰagavorutʰˈjun]) was an ancient Armenian kingdom of the Hellenistic period, located in and around the ancient city of Samosata, which served as its capital. The Iron Age name of Samosata, Kummuh, probably gives its name to Commagene. Commagene has been characterized as a "buffer state" between Armenia, Parthia, Syria, and Rome; culturally, it seems to have been correspondingly mixed. The kings of the Kingdom of Commagene claimed descent from Orontes with Darius I of Persia as their ancestor, by his marriage to Rodogoune, daughter of Artaxerxes II who had a family descent from king Darius I. The territory of Commagene corresponds roughly to the modern Turkish provinces of Adıyaman and northern Antep. Little is known of the region of Commagene prior to the beginning of the 2nd century BC. However, it seems that, from what little evidence remains, Commagene formed part of a larger state that also included the Kingdom of Sophene. This control lasted until c. 163 BC, when the local satrap, Ptolemaeus of Commagene, established himself as independent ruler following the death of the Seleucid king, Antiochus IV Epiphanes. The Kingdom of Commagene maintained its independence until 17 AD, when it was made a Roman province by Emperor Tiberius. It reemerged as an independent kingdom when Antiochus IV of Commagene was reinstated to the throne by order of Caligula, then deprived of it by that same emperor, then restored to it a couple of years later by his successor, Claudius. The re-emergent state lasted until 72 AD, when the Emperor Vespasian finally and definitively made it part of the Roman Empire. One of the kingdom's most lasting visible remains is the archaeological site on Mount Nemrut, a sanctuary dedicated by King Antiochus Theos to a number of syncretistic Graeco-Iranian deities as well as to himself and the deified land of Commagene. It is now a World Heritage Site. The cultural identity of the Kingdom of Commagene has been variously characterized. Pierre Merlat suggests that the Commagenian city of Doliche, like others in its vicinity, was "half Iranianized and half Hellenized". David M. Lang describes Commagene as "a former Armenian satellite kingdom", while Blömer and Winter call it a "Hellenistic kingdom". Frank McLynn denominates it "a small Hellenised Armenian kingdom in southern Anatolia". While suggesting that a local dialect of Aramaic might have been spoken there, Fergus Millar considers that, "In some parts of the Euphrates region, such as Commagene, nothing approaching an answer to questions about local culture is possible." While the language used on public monuments was typically Greek, Commagene's rulers made no secret of their Persian and Armenian affinities. The kings of Commagene claimed descent from the Orontid Dynasty and would therefore have been related to the family that founded the Kingdom of Armenia; the accuracy of these claims, however, is uncertain. At Antiochus Theos' sanctuary at Mount Nemrut, the king erected monumental statues of deities with mixed Greek and Iranian names, such as Zeus-Oromasdes, while celebrating his own descent from the royal families of Persia and Armenia in a Greek-language inscription. Over the course of the first centuries BC and AD, the names given on a tomb at Sofraz Köy show a mix of "typical Hellenistic dynastic names with an early introduction of Latin personal names." Lang notes the vitality of Graeco-Roman culture in Commagene. While few things about his origins are known with certainty, 2nd-century Attic Greek poet Lucian of Samosata claimed to have been born in the former kingdom of Commagene, in Samosata, and described himself in one satirical work as "an Assyrian". Despite writing well after the Roman conquest, Lucian claimed to be "still barbarous in speech and almost wearing a jacket (kandys) in the Assyrian style"; this has been taken as a possible, but not definitive, allusion to the possibility that his native language was an Aramaic dialect. Commagene was originally a small Syro-Hittite kingdom, located in modern south-central Turkey, with its capital at Samosata (modern Samsat, near the Euphrates). It was first mentioned in Assyrian texts as Kummuhu, which was normally an ally of Assyria, but eventually annexed as a province in 708 BC under Sargon II. The Achaemenid Empire then conquered Commagene in the 6th century BC and Alexander the Great conquered the territory in the 4th century BC. After the breakup of the Empire of Alexander the Great, the region became part of the Hellenistic Seleucids, and Commagene emerged in about 163 BC as a state and province in the Greco-Syrian Seleucid Empire. 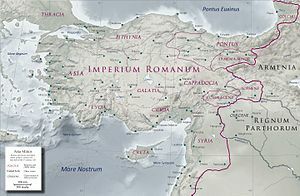 The Hellenistic kingdom of Commagene, bounded by Cilicia on the west and Cappadocia on the north, arose in 162 BC when its governor, Ptolemy, a satrap of the disintegrating Seleucid Empire, declared himself independent. Ptolemy's dynasty was related to the Parthian kings, but his descendant Mithridates I Callinicus (109 BC–70 BC) embraced Hellenistic culture and married the Syrian Greek Princess Laodice VII Thea. His dynasty could thus claim ties with both Alexander the Great and the Persian kings. This marriage may also have been part of a peace treaty between Commagene and the Seleucid Empire. From this point on, the kingdom of Commagene became more Greek than Persian. With Sophene, it was to serve as an important centre for the transmission of Hellenistic and Roman culture in the region. Details are sketchy, but Mithridates Callinicus is thought have accepted Armenian suzerainty during the reign of Tigranes II the Great. Mithridates and Laodice's son was King Antiochus I Theos of Commagene (reigned 70 –38 BC). Antiochus was an ally of the Roman general Pompey during the latter's campaigns against Mithridates VI of Pontus in 64 BC. Thanks to his diplomatic skills, Antiochus was able to keep Commagene independent from the Romans. In 17 when Antiochus III of Commagene died, Emperor Tiberius annexed Commagene to the province of Syria. According to Josephus, this move was supported by the local nobility but opposed by the mass of the common people, who preferred to remain under their kings as before; Tacitus, on the other hand, states that "most preferred Roman, but others royal rule". In 38 AD, Caligula reinstated Antiochus III's son Antiochus IV and also gave him the wild areas of Cilicia to govern. Antiochus IV was the only client king of Commagene under the Roman Empire. Deposed by Caligula and restored again upon Claudius' accession in 41, Antiochus reigned until 72, when Emperor Vespasian deposed the dynasty and definitively re-annexed the territory to Syria, acting on allegations "that Antiochus was about to revolt from the Romans... reported by the Governor Caesennius Paetus". The Legio VI Ferrata, which Paetus led into Commagene, was not resisted by the populace; a day-long battle with Antiochus' sons Epiphanes and Callinicus ended in a draw, and Antiochus surrendered. The Legio III Gallica would occupy the area by 73 AD. A 1st-century letter in Syriac by Mara Bar Serapion describes refugees fleeing the Romans across the Euphrates and bemoans the Romans' refusal to let the refugees return; this might describe the Roman takeover of either 18 or 72. The descendants of Antiochus IV lived prosperously and in distinction in Anatolia, Greece, Italy, and the Middle East. As a testament to the descendants of Antiochus IV, the citizens of Athens erected a funeral monument in honor of his grandson Philopappos, who was a benefactor of the city, upon his death in 116. Another descendant of Antiochus IV was the historian Gaius Asinius Quadratus, who lived in the 3rd century. Commagene extended from the right bank of the Euphrates to the Taurus and Amanus Mountains. Strabo, who counts Commagene as part of Syria, notes the kingdom's fertility. Its capital and chief city was Samosata (now submerged under Atatürk Dam). The boundaries of Commagene fluctuated over time. Under Antiochus Theos, the Kingdom of Commagene controlled a particularly large area. Doliche was under Commagenian rule "for about 35 years"; after being governed by Antiochus Theos, it might have been incorporated into the Roman province of Syria as early as 31 BC. Germanicea declared itself a Commagenian city in Roman times, although originally it was not. On the other hand, Zeugma, while ruled for a time by Commagene, was popularly and traditionally considered to belong to the region of Cyrrhestica; Strabo says it had been assigned to Commagene by Pompey. When the Romans conquered Commagene, the great royal sanctuary at Mount Nemrut was abandoned. The Romans looted the burial tumuli of their goods and the Legio XVI Flavia Firma built and dedicated a bridge. The surrounding thick forests were cut down and cleared by the Romans for wood, timber and charcoal, causing much erosion to the area. Another important archaeological site dating to the Kingdom of Commagene is the sanctuary of Zeus Soter at Damlıca, dedicated in the time of Mithridates II. In Commagene, there is a column topped by an eagle, which has earned the mound the name Karakuş, or Black Bird. An inscription there indicates the presence of a royal tomb that housed three women. The vault of that tomb, however, has also been looted. The main excavations on the site were carried out by Friedrich Karl Dörner of the University of Münster. Another royal burial site is at Arsameia, which also served as a residence of the kings of Commagene. Many of the ancient artifacts from the Kingdom of Commagene are on display at the Adıyaman Museum. ^ a b c Frank McLynn (2010). Marcus Aurelius: A Life. New York: Da Capo Press. p. 377. ISBN 978-0786745807. The best known of these were the Orontids, who emerged as kings of Greater Armenia in the time of Alexander and the Seleucids, and whose family also produced the kings of several of the smaller Armenian kingdoms (Sophene, Commagene). 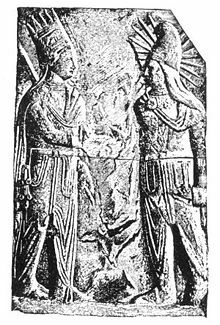 The significance of Kommagene for us lies in the fact that its royal dynasty appears to have been of Armenian origin, an offshoot of the Orontids, who also ruled both Armenia and Sophene and perhaps once even Lesser Armenia as well, had we had more information on the founding of that elusive Armenian state. That Kommagene belonged to the Armenian kingdom in the Orontid period is demonstrated first by the fact that two of its cities (Samosata and Arsameia) appear to have been named after Orontid kings, and second by the fact that it was ruled by a branch of the Orontid dynasty itself. ^ Wolfgang, Haase (1986). Aufstieg und Niedergang der römischen Welt: Geschichte und Kultur Roms im spiegel der neueren Forschung. Walter de Gruyter. p. 736. ISBN 978-3-11-007337-9. ^ Blömer & Winter (2011), p. 142. ^ a b Pierre Merlat (1960). "Le site de Doliché". Jupiter Dolichenus : Essai d'interprétation et de synthèse. Presses Universitaires de France. p. 3. une de ces nombreuses localités mi-iranisées, mi-hellénisées d'Asie Mineure et de Syrie du Nord . ^ Cook, J.M. (1993). The Persian Empire ([Repr.] ed.). New York: Barns & Noble Books. pp. 170, 173, 193, 212, 213, 216, 217, 221–223, 257, 263. ISBN 978-1-56619-115-9. ^ Hovannisian, Richard G. (1997). The Armenian People from Ancient to Modern Times - 2 Vols. St. Martin's Press, New York. ^ Blömer & Winter (2011), p. 13. ^ Hazel, J. (2002). Who's Who in the Roman World. Psychology Press. p. 13. ISBN 9780415291620. Retrieved 20 February 2014. ^ Blömer & Winter (2011), pp. 10–11. ^ UNESCO World Heritage Centre. "Nemrut Dağ". Retrieved 12 October 2017. ^ a b c d e Blömer & Winter (2011), p. 19. ^ a b Millar (1993), p. 454. ^ a b Millar (1993), p. 452. ^ a b Millar (1993), p. 453. ^ Millar (1993), pp. 453, 456. ^ Trevor Bryce (2012). The World of the Neo-Hittite Kingdoms: A Political and Military History. Oxford/New York: Oxford University Press. pp. 110–114, 304. ISBN 978-0-19-921872-1. ^ Blömer & Winter (2011), pp. 24–25. ^ a b Millar (1993), p. 53. ^ Millar (1993), p. 59. ^ Ewald, Heinrich (1886). The history of Israel, Volume 8. Longmans, Green, & Co. p. 23. ^ a b Millar (1993), p. 82. ^ Millar (1993), pp. 460–462. ^ Anna F. C. Collar. "Commagene, Communication and the Cult of Jupiter Dolichenus". Iuppiter Dolichenus: Vom Lokalkult zur Reichsreligion. Michael Blömer and Engelbert Winter (eds). Tübingen: Mohr Siebeck. pp. 102–103. ISBN 978-3-16-151797-6. ^ Blömer & Winter (2011), p. 20. ^ Blömer & Winter (2011), p. 150-155. ^ Blömer & Winter (2011), pp. 96–97. ^ "Yeni Kale / Eski Kâhta - Türkei" (in German). 2011. Retrieved 25 July 2015. ^ Blömer & Winter (2011), p. 124. Blömer, Michael; Winter, Engelbert (2011). Commagene: The Land of the Gods between the Taurus and the Euphrates. Homer Kitabevi. ISBN 978-9944-483-35-3. Millar, Fergus (1993). The Roman Near East, 31 BC – AD 337. Cambridge, Massachusetts: Harvard University Press. ISBN 978-0-674-77885-6. Wikimedia Commons has media related to Commagene.